Good quality food is especially important for a working dog. These dogs are using a lot of energy to stay active for long periods of time. Between scent tracking, running, swimming and retrieving, your hunting dog is putting in a lot of work and needs the right diet full of quality nutrition to stay in top form. A hunting dog can be any breed of dog used for hunting with their human companion. Hunting dogs are typically used for tracking, retrieving, sighting and flushing out a game animal. All hunting dog breeds are typically active, athletic and extremely smart. They enjoy working with their human partners to track game. These breeds crave the mental stimulation and physical demands of a day out hunting. They do well with positive reinforcement and training. They will take great pride in a good day’s work and feeling as though they are helping you on the hunt. Although these breeds require a lot of training to properly hunt safely with their owners, their innate ability to perform the tasks at hand make it enjoyable for both the dog and their owner. The size and lifespan will vary greatly by the breed of hunting dog you have but they are typically medium to large sized dogs which would put their life expectancy between 10 and 14 years. Hunting dogs require a diet of high-quality food, rich in protein and carbohydrates to keep them fueled on a day of hunting. Different breeds have different skill sets that hunters will use for the different game their tracking. While there are several different types of dogs that can make a good hunting dog, here are a few breeds that are commonly used for their natural hunting abilities. To help fuel their active lifestyle, you’ll want to feed your hunting dog high-quality dog food. Foods that have a high percentage of protein, good fibers, whole grains, fresh fruits and vegetables, and vitamins and minerals are the best ones to start with. High-Quality food will be free of artificial colors, preservatives, and fillers. These are used to take the place of more expensive ingredients and will short your dog of the proper nutrients they require. Quality food is vital to giving your hunting dog the energy they need. Their metabolisms are working overtime on a hunting day and you want to give them the endurance they need. Since hunting dogs are outdoors so often, there are some common health issues that can arise from being exposed to the elements. Hunting dogs are constantly in an out of the water, exposed to heat or bitter colds, traipsing through brushes and ingesting natural lake waters. You should always carry a first-aid kit not only for yourself but also for your hunting dog while you’re out on a hunt. Also, keep a lot of fresh water available for your pup so they are less likely to drink from the water you’re hunting near. This is also important in the hot summer months when dogs are prone to heat exhaustion. Here are some common illnesses found in hunting dogs and how you can prevent and treat them. Ticks are fairly common throughout the United States, but they are mostly found in the Northeast and Midwest. Although many deer ticks are harmless if they are found and removed quickly, about 30% of them contain Lyme Disease bacteria. If you’re a hunter, you’ll want to vaccinate your hunting dog with a Lyme Disease vaccine when they are a puppy. This is key to preventing the disease and it should be a no brainer to get this if you’re using your dog for hunting. If you find your dog has Lyme Disease in an early stage, antibiotics are also very effective in curing the disease. The symptoms of Lyme Disease can be tricky to diagnose. It will take a while for your dog to show symptoms. When they do, the disease has already been present for quite some time. Symptoms include sore legs, stiff muscles, pain when walking, lethargy and a loss of appetite. This may at first appear to be a leg injury but if you have recently been outdoors where ticks are present and you didn’t vaccinate your dog, it’s best to take them in for blood work. Hypothermia means your dog is suffering from extremely low body temperature. Hypothermia can vary by severity. If your dog is exposed to extreme cold and you see signs of mental absentness, slow breathing, stiff muscles, and shivering, your dog may be showing signs of hypothermia. If caught early, you can stave off hypothermia by bringing your dog’s body temperature up. You’ll want to rest your dog indoors, cover them with blankets and have them lay on a heating pad. If it’s reached a severe stage, warm IV fluids are used by a vet or your dog is given an enema using warm water. They may also need oxygen and blood in extreme cases. Hypothermia can be prevented by using good common sense. On cold days, put a jacket on your dog to keep their core warm. Take indoor breaks often, even if it’s just hopping in your heated car. Keep dogs away from frozen water or warm them quickly after exposure. If it’s too cold, skip the hunt that day. Blastomycosis is a fungus that is found on the floor of a forest, swamp or marsh area. These areas are naturally where you’ll find geese and other game birds. Dogs pick up their scent in the infected areas and it goes right up their nasal passages. There’s no way to detect this and there is no vaccine to ward it off. Dogs are born scent trackers and their noses are always pointed to the ground where they become susceptible to sniffing up spores of bacteria. If your dog has been in these areas and suddenly has open, seeping wounds on his paws, a bad cough and they have become lethargic, it’s best to take them to a vet as quickly as possible. There are treatments available to fight off the fungus and get your dog healthy again. If you suspect the area, you’re in may contain Blastomycosis fungus, call a local veterinarian. They can usually tell you if there is a lot of fungus present, so you know before you go out. It is typically found near the Mississippi and Ohio Rivers, St. Lawrence Seaway and the southeastern part of the United States. Cyanobacteria is named after the blue-green pond scum found in some fresh or sea water. It’s typically found at the end of summer or start of fall when the water is warm. Unfortunately, this is also prime bird hunting season. Dogs are harmed by these bacteria when they swim in the water and ingest it. Warm, stagnant water is where these bacteria are usually found. If you see foam or pond scum, those are all signs of bacteria blooms. Of course, there are non-toxic blooms found on all water sources, use your best judgment. These blooms are highly toxic and even deadly. If your dog ingests Cyanobacteria, she will show signs by vomiting, convulsing or having open wounds on her skin. It’s important to head to your vet right away. To prevent exposure, bring fresh drinking water for your dog is less likely to drink contaminated water. Rinse your dog quickly after they get out of the water and steer clear of any water that is too scummy or stagnant. It’s not worth the harm it can do. The best food for your hunting dog will contain plenty of good fats, protein, carbs, and nutrients to keep them healthy and active for many years. When your dog is a puppy or young and active, they will need more food and a higher concentration of food fats to keep them properly fueled. The more your dog ages and slows down, he’ll need fewer calories. Protein is one of the most important components of your dog’s diet. Pure, animal protein from fresh sources is always best. Your hunting dog needs a high-quality protein to help them grow, keep muscle tone and have long-lasting energy. Unnatural ingredients should never be given to your hunting dog. Meat by-products, fillers such as corn, soy, and wheat are added to save money by manufactures and will do more harm to your beloved dog than good. Common allergens should also be avoided if you suspect your dog has a food intolerance. Allergens in dogs include dairy, wheat, chicken, and grains. While not all dogs require a grain-free diet, you’ll see a lot of these recipes on the market. Know that facts on if grain-free food is more helpful or harmful to your pup on the FDA’s website, fda.gov. If your dog does have an allergy to grain or something else, you’ll notice signs of itching, paw licking, and even hair loss. 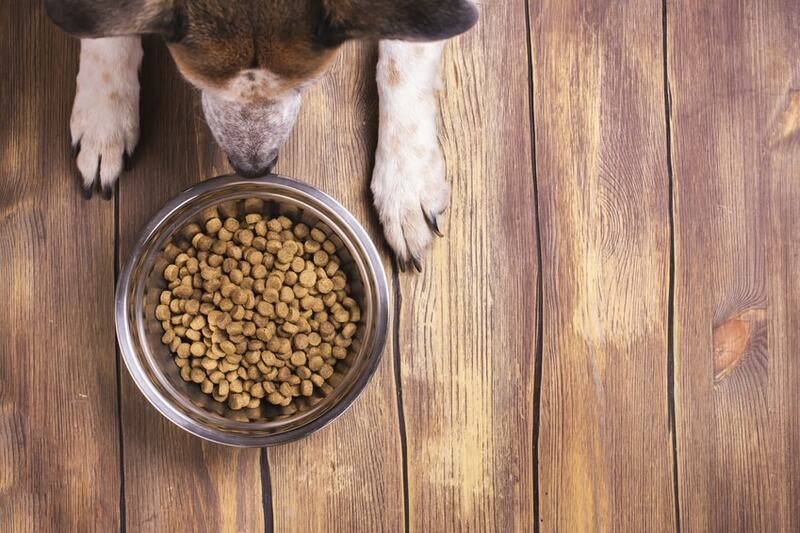 Your vet and an elimination diet can help find the source of your dog’s trouble. Stay away from artificial fillers, colors, and preservatives. These ingredients and chemicals have been linked to cancer and several other health problems. Some of the brands that are the worst offenders in using ingredients such as these are Pedigree, Retriever Hi Protein, Purina Dog Chow, Great Choice, Kal Kan, and Kibbles n’ Bits. According to dogfoodnetwork.com, these are some of the worst brands to feed your dog. Read more about what makes them so harmful and the ingredients used on their website. The worst foods to feed your hunting dog are those made with high concentrations of corn, gluten meal, soybean and meat by-products. The first five ingredients listed on your dog’s food are the most important. These are the ingredients that make up the five highest percentage of their food. You should always want to see a real, animal protein, and fresh fruit or vegetable listed in the top five and never any artificial ingredients or meat by-product. Since hunting dogs are incredibly athletic and active, they require a good number of calories to keep them going. The amount of food will vary on the breed, size and age of your hunting dog, however, most hunting breeds are of medium to large size. Puppy hunting dogs should be fed, three to four times a day. The amount will depend on the breed, but it will usually average four to six cups daily. Continue to feed your hunting dog a puppy food until around 12 months of age. Adult hunting dogs will eat around three to four cups of food daily between two meals. Some may only need two cups and will only eat once a day. On a hunting day, always feed your dog twice. If he doesn’t typically eat in the morning, entice him with a meal topper, some broth or wet food added to his kibble. He’ll need his energy, so you’ll need to help him eat. Feed him again once you get home. Your dog should gobble up his dinner without any problem after a long, hard, day. Senior hunting dogs may slow down as they age. They won’t need as many calories the less active they become, and they’ll often only eat once a day. They should continue to eat two to four cups of food a day into their senior years. Keep your dog as active as possible for as long as they are willing. Despite old age, they still will crave activity. Hunting dogs need high-quality food, chocked-full of nutrients. She is your best hunting pal and most loyal companion. Treat her as such by feeding her the best food possible and you’ll enjoy many years of hunting together. Here are some of the best foods on the market for your favorite hunting partner. Ziwi Peak dog food is air-dried during a two-part cooking process. Similar to a raw diet, this is pure, animal protein. Using beef from New Zealand, they use one step to preserve all of the ingredients naturally and a second step to remove bacteria and pathogens. Unlike dehydrated food, you don’t need to moisten it. These bits of food contain more moisture than traditional kibble. It’s easy to digest, free of preservatives and artificial ingredients and comes, conveniently air-dried and ready to serve. Ollie is a human-grade dog food that is freshly prepared individually for your pooch. This fresh food comes in a variety of recipes and all of them can be customized for your dog’s specific needs, age and allergies. This food is all human-grade and sourced from the United States or Australia. The use, grass-fed animal protein, fresh fruits, vegetables, starches, grains, amino acids, and fatty oils to keep your hunting dog well-fed. The packages arrive at your door on a regular schedule and you can store them in your freezer and refrigerator until you’re ready to serve them. Make sure to let them thaw in the fridge for up to 24-hours before you give them to your dog. A limited ingredient recipe such as this one from Natural Balance is grain-free and perfect for dogs with sensitive stomachs or food intolerances. This recipe, for example, comes with bison, sweet potatoes, peas, and DHA to help your hunting dog stay sharp while on a hunt. The limited ingredient, wet puppy food from Zignature is grain-free and made from lamb, raised on farms in New Zealand. It also includes peas, carrots, and chickpeas. With minerals, vitamins, protein, and antioxidants, this food contains everything your growing puppy needs. American Journey is designed for active, growing puppies. It’s made with real lamb, amino acids, vegetables, fruit, and antioxidants. There is plenty of omega fatty acids to support a puppy’s brain development. This recipe will help keep your hunting dog’s brain sharp. Your senior hunting dog can still have some healthy, active years ahead of him. Help him make the most of them by feeding him a high-quality food. Help keep him sharp, strong and active with some of the foods listed below. The Young At Heart recipe by Solid Gold is a holistic dog food that is full of nutrients and protein for your senior hunting dog. This recipe is grain and gluten free so it’s well suited for dogs with allergies. This recipe is also great for your senior’s metabolism. It will help with calorie control and weight management and your dog becomes less active. This senior recipe from American Journey is grain-free. There are vitamins and nutrients to promote bone, immune and coat health. This is important for aging hunting dogs. This recipe is well-balanced to help with weight management as the dog’s age. Real chicken, blueberries, and sweet potatoes are some of the main ingredients.